Rituals and traditions play an important part in our lives. Whether we identify as religious, spiritual or neither, rituals and traditions are forms of structure that help life flow more easily. As bereaved parents, the importance of tradition is particularly felt around the holiday season and Christmas, when having traditions, or creating new traditions can help us get through potentially challenging times. Christmas, end of year celebrations, family get-together's, New year celebrations and the list goes on; these are all potentially times, places or gatherings that can be awkward after child loss. Having to deal with other people's 'festive' mood when you are feeling like a chunk of you is missing, can feel an impossible, Herculean task. At these times, rituals and traditions can be touchstones that help us move through what can be an emotionally challenging time. Traditions for this time of year can bring great comfort, and knowing there are certain places, events, activities or tasks you complete each year can help structure the holiday season. Traditions that you may already have undertaken can take on more significance after you've lost your child. They feel more important, as they unite you with all that has gone before. 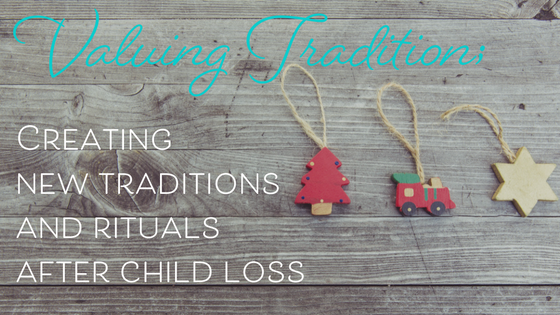 These types of traditions can include attending church, lighting candles, purchasing Christmas ornaments in memory of your child, journaling, making a donation to a charity in the name of your lost baby or something else altogether. In my family our traditions, or rituals if you like, around this time of year include time at the beach as a family. Christmas is summertime here, and in the days and weeks after we lost our son, the beach was our sanctuary. We would escape to the beach as a refuge from the grief, and just walk, or play. Being in the moment with our then toddler (firstborn) was how we coped when it all felt too much. And so, spending time at the beach remains a firm family tradition that connects us to our lost baby, but also brings us together as a family and brings joy. Another tradition we embrace is the making of a gingerbread house. The boys and I get covered in icing as we decorate our gingerbread house. It's hot and humid in Sydney in December, so our gingerbread house nearly always collapses, prompting either fits of giggles or wails of disbelief. This is a purely fun (and slightly messy) tradition but provides an opportunity again for us to connect and truly be present with each other. And the boys always add a little touch to our gingerbread house to remember their angel brother, which makes it an extra special tradition. After baby loss, maintaining these old traditions can be incredibly important, or even more so than before you lost your child as they connect you to a greater timeline and purpose. Conversely, some people can find old traditions result in them feeling angry, hurt and upset as they no longer feel connected to anything. This is where new traditions come into play. After the loss of a child you may find yourself creating new traditions, either by choice or by default. New rituals and activities that mark anniversaries or help you do something special to honour your lost baby are a beautiful and special way to acknowledge your child. One of our newer traditions is the purchase of an angel ornament for our festive tree. This is a small, new tradition that helps us ensure every year we have a new beautiful ornament for our tree. It's symbolic, whilst also a lovely ritual I really enjoy. Taking time to find the right ornament, just one, is a really special part of honouring our son. Each year we also purchase or make special gifts for good friends who have also lost babies, and enjoy exchanging these gifts with them. It's a new tradition formed purely because we all met around this time of year - only weeks after we had each lost our babies. We also try to attend an annual memorial service for parents who have lost a child. We haven't always been able to attend this memorial service, as it frequently falls on our elder sons birthday. But when we can attend, it's part of our ritual for this time of year. As we enter a time that is meant to be full of celebration and joy, consider what old traditions you enjoy and are meaningful for you. Also consider what new traditions you might find bring you a sense of connection and hope. By embracing or implementing a few new or old traditions specific for you, your family and your life, you may find the traditions help you cope with what can be a challenging time. You may even discover new traditions that bring you joy as you honour your angel child. I support men and women to live their best life, and in that way, honour the loved one they have lost. Book your complimentary consult to arrange a chat where we can talk about what your best life means for you.